"Hold On Trust For Aman" - More Devastating Evidence From The ICAC Investigation! Nominee - Lawyer Richard Christopher Barnes was holding tens of millions of dollars in a Hong Kong bank account "in trust" for his client Musa Aman, before it was forwarded to a UBS Zurich account in the Chief Minister's own name! A multi-million US dollar account, opened in the name of Richard Christopher Barnes with the Swiss Bank UBS in Hong Kong, was operating under written instructions that the money was to be held in trust for Musa Aman, according to evidence gained from the Hong Kong authorities. A letter, dated 25th May 2007 and now in the possession of the Hong Kong Independent Commission Against Corruption (ICAC), stated the account should “hold [the money] on trust for Aman”. 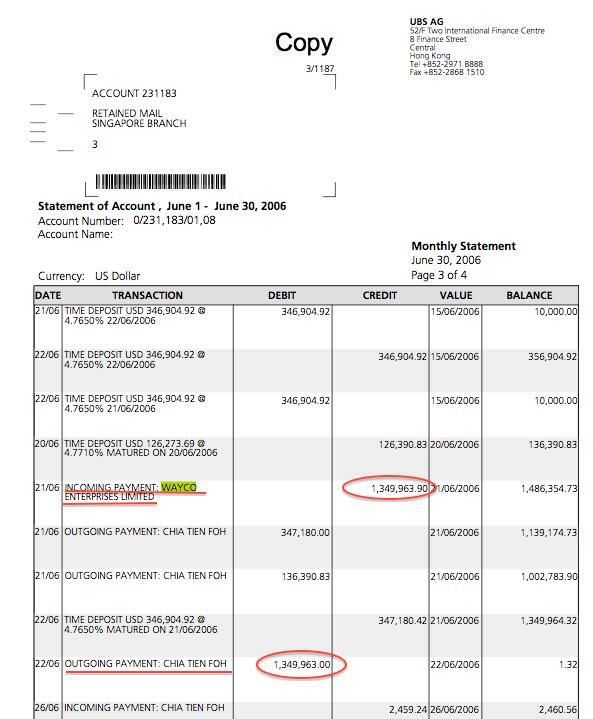 Investigators noted that on 31st May 2008 that account contained USD 29.6 million! Flow chart to Musa’s own Zurich account! 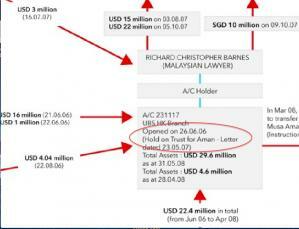 A key flow chart, compiled by the ICAC, shows a money trail leading from timber kickbacks to Musa Aman’s own personal bank account with UBS in Zurich! Barnes, a Sabah lawyer, was believed to be acting as a nominee for Musa Aman. 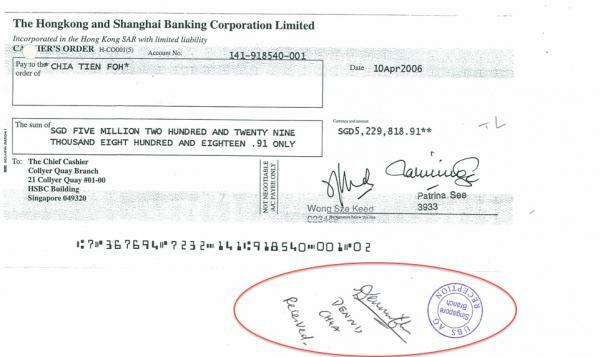 The information on his key account relating to the Chief Minister, UBS A/C231117, forms part of a flow chart analysis, compiled by ICAC investigators, who were tracing the money flowing in and out of the Hong Kong bank accounts controlled by one of Musa’s other known side-kicks, Michael Chia (Chia Tien Foh). "Hold on trust for Aman" - the written instruction for the money flowing in from Chia's accounts into Barnes' UBS holding account in Hong Kong. Chia had had been arrested in the city-state while attempting to smuggle SG$16million in cash to Malaysia, sparking a major money laundering investigation. A parallel investigation was undertaken by Malaysia’s Anti-Corruption Commission (MACC). However we have learnt that inter-country cooperation was blocked by Musa’s close family contact, the Attorney General, Abdul Gani. The ICAC flow chart (below) illustrates how money was coming into Chia’s accounts from companies related to timber production in Sabah and flowing out to accounts being managed on behalf of Chief Minister, Musa Aman, including the one in the name of Richard Christopher Barnes. 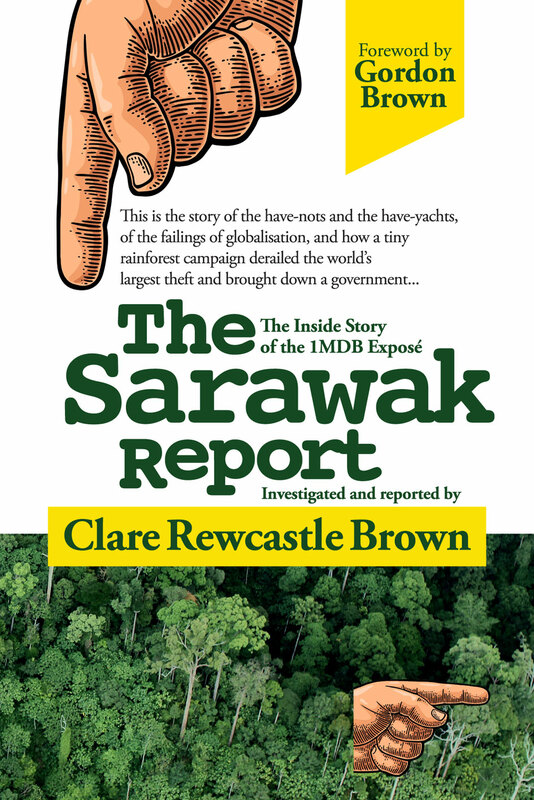 The Malaysian Anti-Corruption Commission received a copy of this information and Sarawak Report now also has a copy. We also have copies of numerous bank statements that verify the information in the flow chart. Those who claim these are forged should ask UBS and HSBC to confirm that these accounts never existed and to make a statement that there was no letter of 23.05.07, commanding that the UBS Christoper Richard Barnes account should be held “on trust for Aman”. Likewise, doubters should ask the ICAC to deny that the flow chart information is authentic. Final destination was Musa Aman’s Zurich UBS account! The flow chart shows clearly how money coming in from certain companies into accounts, managed by Michael Chia and his nominees in Hong Kong, was then passing on to a number of British Virgin Island companies (CTF International, Zenique Investment, Blisstop Corp) and then back to the UBS Hong Kong account managed by Richard Christopher Barnes, A/C 231117. The chart next clearly demonstrates that the accumulated money was then being passed straight from Barnes into an account in Zurich in the name of Musa Aman, UBS A/C 230-75069201. The Hong Kong Account 231117, which had been in existence since 2006, received a US$22.4 million injection of money from another Barnes account, between April 28th and May 31st. There was an instruction to forward that money on to the Musa Aman account in Zurich (opened back in 1999), which already held US$8.9million. However, we understand that this instruction was frozen, along with the money, when the ICAC investigators moved in. Nevertheless, late last year the 3 year statutory period on investigations ran out and the money is now believed to have been accessed by the account holders. Those involved blame Malaysia’s refusal to sign a cooperation agreement on the investigation for the collapse of the case and the subsequent release of all the money back to Musa and his collaborators. 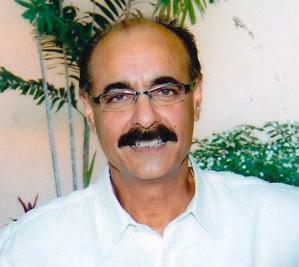 That refusal was the responsibility of Attorney General, Abdul Gani Patail, a close relative of Musa. We have ascertained that the entire web of these transactions was managed by a UBS bank employee at the time, client manager Denis Chua. Chua had originally worked at the Singapore branch for HSBC Hong Kong, where he managed Chia’s account until 2006. However, after Chua moved to UBS, HSBC reviewed the Chia accounts and requested that they be closed down, owing to the irregularity of such huge sums being channelled through it. It is unclear whether or not HSBC notified the authorities as they closed the account. However, they then proceeded authorise the release of the contents of the account. 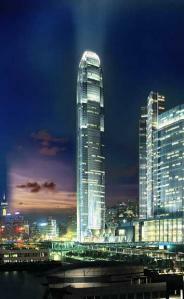 which came to the enormous sum of SG$13.4million and US$7.19 million. 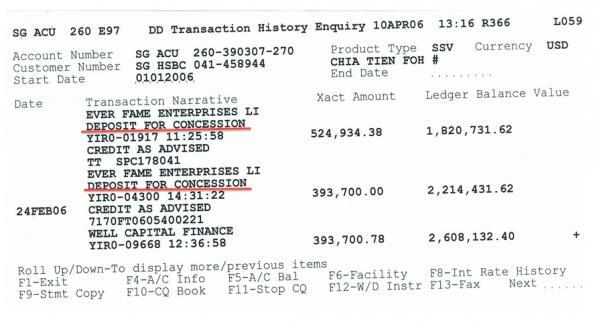 HSBC provided a series of cashiers orders for millions of dollars made out to Chia, which he was then able to present to Chua for payment into his new account at UBS. Forgery? - SG$5.2million cash order made out to Chia - Accepted by UBS and received and signed for by Denis Chua! This was one of several made out to Chia in order for him to remove his money from his HSBC account. 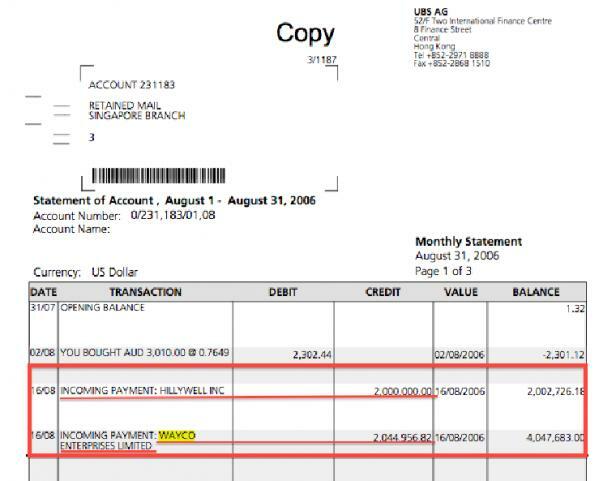 We have copies of these cashiers orders and the flow chart further confirms our information that Chia presented these bank orders to Chua, who opened the new account A/C 231026 at his new employers, the Swiss bank UBS in June 2006. Chua also opened a series of other accounts for collaborators of Chia, who also channelled money through to Barnes via a separate set of BVI companies, which Chua had helped them to set up. These BVI companies then opened UBS bank accounts back in Hong Kong/Singapore to receive money through. Presumably, by spreading the money into different accounts Chia was hoping to make the enormous sums involved seem less conspicuous! However, the authorities saw through the ruse. The MACC case number against Musa Aman was lodged as Complaint 113/2009. Based on our extensive documents and insider information, Sarawak Report is able to confirm that the money pouring into Michael Chia’s accounts were the proceeds of timber corruption and that the young man was acting as the collecting agent for kickbacks for concessions, granted by Musa Aman in his capacity as Chairman of the Board of Yayasan Sabah. According to insiders, much of the money coming into the Chia accounts was linked to concessions awarded to the Sabah timber trader Andrew Lim of the Priceworth Industries (listed on the Kuala Lumpur Stock Exchange), the brother of the tycoon Freddy Lim. Freddy Lim, who controls Kretam Holding, also on the KL Stock Exchange, is the controlling influence behind the Hong Kong company Wayco Enterprises Ltd, which acts as an agent between Malaysian timber traders and buyers from China and elsewhere. 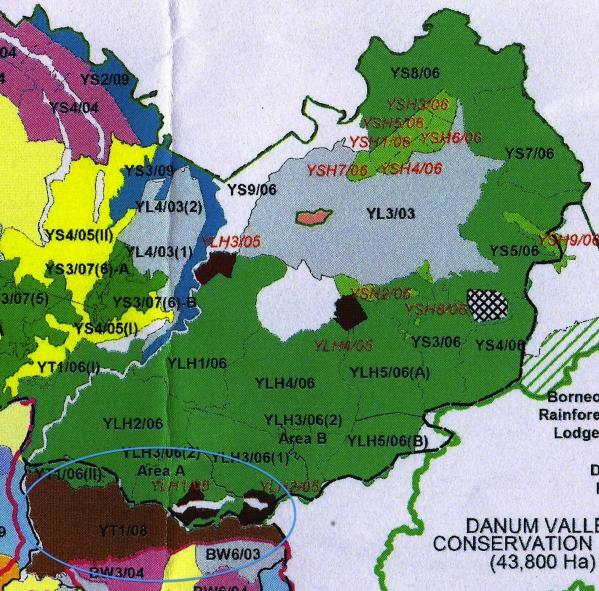 Musa Aman awarded Lim numerous concessions in Sabah’s remaining forest areas. While Andrew Lim was receiving valuable timber concessions worth millions of ringgit “concurred by the Chairman of Board of Trustees Yayasan Sabah” (i.e. the Chief Minister Musa Aman), his brother Freddie’s companies Wayco and Hillywell were pouring millions into Chia’s accounts, which were then wending their way into Aman’s own named accounts. The above account was one of numerous account used by Chia together with his wife Yap Loo Mein and business associates to process millions and millions of ringgit. We can see money coming in from companies like Wayco was being extracted right out again by Chia into another account as it flowed towards its final destination. The ICAC chart is not the whole story, according to our further evidence. The actual amounts siphoned off by Chia in kickbacks from Sabah’s timber trade amounted to billions of dollars say insiders. Another payee, as we have demonstrated in a previous report is Borion Enterprise Ltd, owned by the Sarawak tycoon,Ting Pek King. It too was paying millions of dollars into Chia accounts, but is not mentioned in the flow chart. Other companies involved represented other major tycoons, for example Admond Looh of Java Industries, listed on the KL Stock Exchange, who also received numerous timber concessions from the Musa regime. 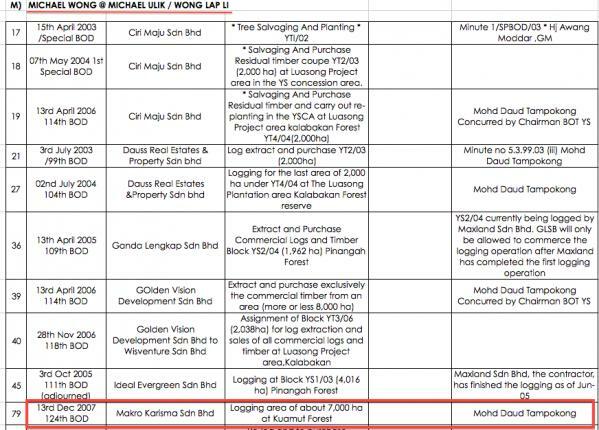 "Concurred by Chairman of the Board of Trustees" - 10,000 hectares of virgin forest was signed off to Admond Looh in the Pinangah Forest Reserve, according to the MACC list of concessions (partial copy of list of Looh's licences). 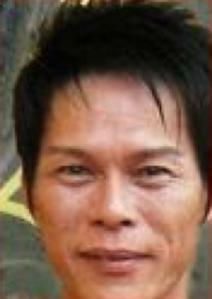 Admond Looh is the beneficial owner of the company Ever Fame Enterprises Limited. A series of telegraphic transfers into Chia’s own account (example below) even name the reason as “Deposit For Concession”! "Deposit for Concession"! - Payments into Michael Chia's accounts from Ever Fame Enterprise represented kickbacks from Admond Looh, according to statements recorded by the MACC. Those who are still swallowing the idea that this whole body of evidence is mere forgery and fiction have a simple recourse to prove their point. They can apply to UBS and HSBC and indeed the ICAC and ask these bodies to confirm that our documents are false information. They can request a statement that these bank accounts never existed or that the statements have been doctored. Mr Musa Aman may be a busy chap, but a quick phone call to these institutions by his office should achieve the result with very little of his valuable time being wasted! Destroying the Heart of Borneo, which Musa Aman pretends to protect! The concessions awarded to Andrew Lim and another timber tycoon, Elbert Lim, included two large areas of forest in the WWF Heart of Borneo Treaty Area. The licences allowed logging in Malua Forest Reserve. 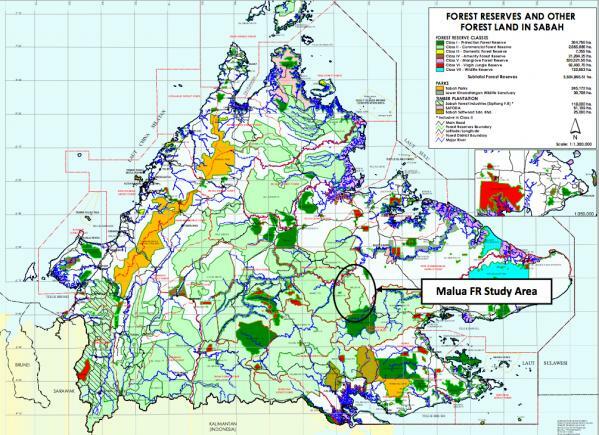 Malua Forest Reserve - Musa Aman allocated these two licences to two cronies just before he signed the Heart of Borneo Treaty ! Protected area in the Heart of Borneo has been quickly logged in advance! Our researches into Musa Aman’s management of Yayasan Sabah corroborates the information that the Chief Minister has been ‘maximising the squeeze’ on Sabah’s remaining forest areas to get as much logging done as possible. We have numerous examples of formerly protected areas being handed out in concessions. One such area was the Protected Forest Reserve in Kuamat Forest below, designated to be left untouched, until Yayasan slipped through a change in its status in 2007. 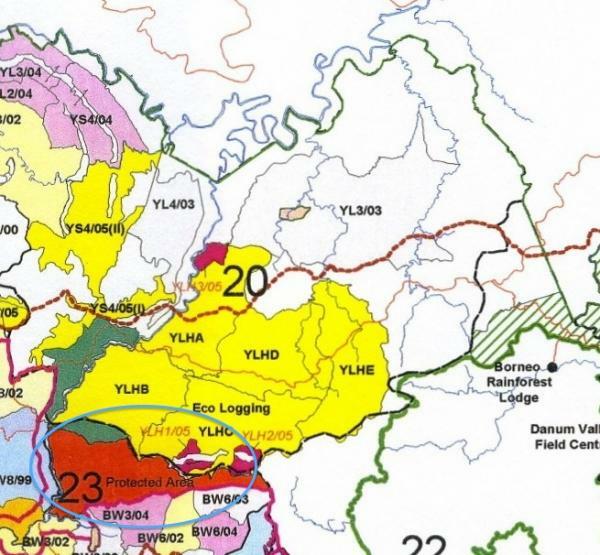 New maps now show the area as a full-blown timber concession YT1/08. One moment protected and the next handed as Concession YT1/08 for destruction to Michael Wong - what was Musa's motive? 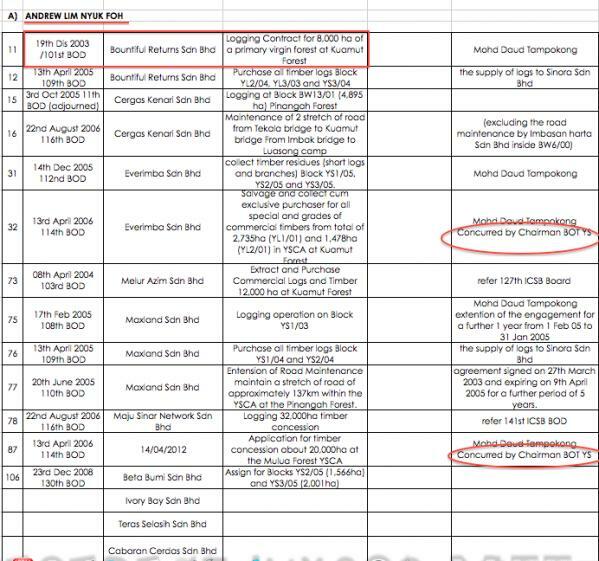 The handing out of the concession is clearly noted among the numerous concessions listed to Wong in the MACC concession document in our possession. We have numerous further examples of concessions handed out to cronies of virgin forest areas and protected areas. These areas should at the very least have been sensitively logged with the proper taxes on the profit going back to the State of Sabah. However, insiders say that most of these areas have instead been destroyed by “illegal logging” practices, meaning that the trees have instead been clear felled and very little of the wood has been declared through the official channels and therefore properly taxed. The contention is that much of this “illegal logging” is carried out by the licence holders themselves who want to maximise their profits on the area and avoid tax. Our information is that kickbacks demanded by Musa’s agent Chia were on average RM2,500 per hectare of each concession. This amounts to billions of dollars in kickbacks given the huge areas that have been logged since Musa took power. The concept of careful and sustainable logging, of course, becomes impossible once the boss is accepting kickbacks and is no longer in a position to request that operators act according to the rules. Musa Aman and his neighbour Taib Mahmud in Sarawak have managed to operate their multi-million dollar thefts from their respective states because of the secrecy behind which they conduct their management of the forests. Timber concessions in Sabah, like Sarawak are treated like state secrets. Information about who gets what is “Restricted” to “Level 1″ Category readers! not to be duplicated, distributed or displayed to unauthorised eyes, according to the maps we have been leaked! Yayasan Sabah maps - Why so secret?! Musa’s secrecy surrounding his activities as the Head of Yayasan Sabah means that all his denials and protestations of innocence have to be taken on trust. Whereas we have piles of documentation that support the allegations of massive graft and timber corruption that were being investigated by the MACC and the ICAC in 2008 before intervention by the Attorney General closed down these enquiries and prevented further action. We will be releasing more of this material, which has come into our hands and also be exposing the devastating effect on Sabah’s forests by greed-driven, unsustainable logging over the past few years. Insiders say that graft and greed in Yayasan Sabah has reached a whole new level since Musa Aman graduated from being its Chief Executive to the Head of State and Chairman of its Board of Trustees. Little forest is now left in Sabah. More and more of it is being currently earmarked for “industrial timber production” and oil palm plantation by Musa Aman’s government. The latest ploy, spearheaded by Musa is so-called ‘mosaic planting’ a scheme to clear fell forest in Natural Forest Management areas. Critics say it is just another method for grabbing the timber from areas that should be protected.